maybe an extra big piece of bacon is a good treatment for “wallet heartburn”? We may need SURGERY to remove Dad’s wallet from his pocket for any of this work to be done! HAHAHAHAHA We would HATE to cut down any old trees but if these have a disease then they need to go. Mom and Dad planted them 19 years ago and there’s no way they can afford to have them all removed at once…….this may take a lot of time!!!!! The patio sounds like a nice place to start. It’ll be a good place for your parents to accidentally drop crumbs of food for you, S. Paws crossed…. Absolutely! I’ll prefer licking those crumbs up from the patio vs. the grass/dirt. Will taste a whole lot better!!!!! Oh, my. Not what your pawrents expected to hear, I’m sure. So sad that the trees may have to go. One thing at a time, though, Sammy! Right? Nooooooooooo on the cypress trees! Nooooooooooooo on the maples! SAD!!! See my extensively extended response to your response on my comment on your post yesterday! I forgot… Maniac Marv is still available. He could knock those cypress trees out in, oh about a year. Beep! Beep! BEEP! We can’t imagine cutting down that beautiful tree. Unfortunately the sick ones will probably have to go but we hope you can do it slowly and not have wallet heartburn. At least bacon will make it better!!! Yikes- that is too bad about the cypress trees. I wouldn’t cut down the maples either. Everything is so expensive now, your Mom is lucky that your Dad would even have someone come out to look. My cheapo, oops, I mean hubby would never agree. 🙂 Thank you for the blogoversary card, we will diplay it tomorrow and thank you for being our friend and my Sammy thanks you for your friendship too XO. We hate seeing trees go bye-bye too Sammy! removal. 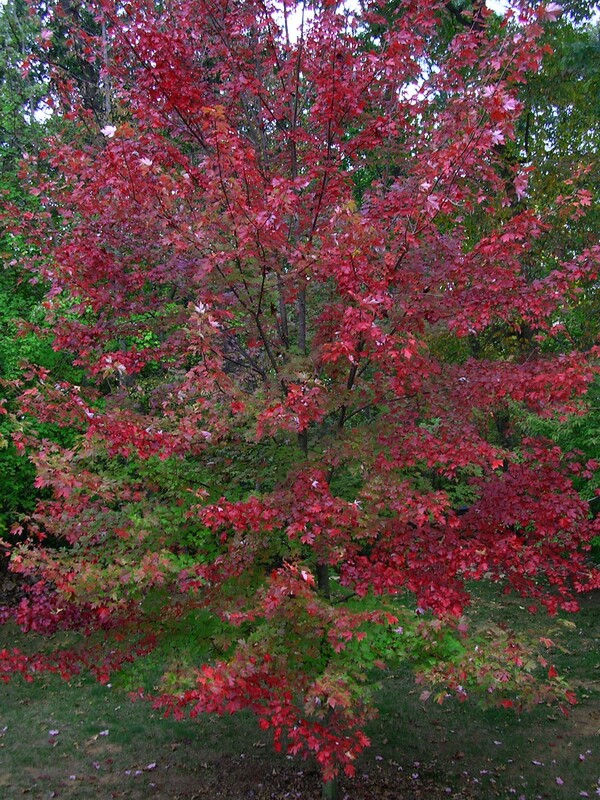 As for the red maple I’m sorry that has to stay…we don’t discard or remove anything red from the house or the yard. Mom is a red freak! Madi my dear that red maple (actually there are TWO of those) is staying right where it is. Dad said NO to the guy’s thoughts about them believe me!!!!! I’m sad to hear about your Leyland cypresses. 😦 You know about our experience with some of our oaks. I knew they had that disease and they had to go, but it was still a sad sight. 😦 And what it can cost! We know that, too. We had to have about 100 of our trees trimmed or – as with the oaks – cut down last year. Two different crews [up to 7 people at a time] worked here for more than two weeks. That makd more than just a dent in our wallets. 😉 😦 But it had to be done. As to your maples: I hope they won’t be cut down. They look way too pretty. Yes Mr. Pit I remember all that tree work you had to have done………….it’s not an inexpensive proposition but it sometimes just HAS to be done. Especially with diseases……this Leyland blight stuff is wicked. We hope that when we ARE able to afford to have them taken down we might do it a few at a time…..our wallets would appreciate that too!!!!! p.s. We agree about the maples – they are NOT going anywhere! I’ll keep my fingers crossed for the cypresses. Oh no, that’s terrible about the cypress trees. 😦 That guy did not have much good news, did he? At least the patio sounds doable. You’re right………..but we are still going to get a tree specialist to tell us HIS professional opinion. A landscape designer is great but doesn’t necessarily know everything about trees!!! Yes – the patio will be doable!!! Landscaping is soooooo much fun! Hi Beautiful Nellie! We will see what a real TREE EXPERT has to say about those trees before we do anything – but for SURE the maples are staying!!!! Oh Sammy dat’s so not wight. Cut down all da twees yous luv? Moommy wuld be happy to have these oversized diseased oaks gone, but they’re noot nearly as purretty as yous twees. Glad yous got sum bacon. Dat bwekky plate sure looks nommy. Well we won’t take down any trees until a tree expert tells us what HE thinks…..the Landscaper was thinking that we wanted more SUN in the yard in the back so that’s why he said to whack down those maples – we will NOT be doing that but need to know if the Leyland cypress need to come down in HIS opinion. It’s smart to remove DEAD trees…..but before we remove anything we’ll get Mr. Tree Expert to look at them………….we love trees and want to keep them if we can! I’m with you on that expensive landscaping stuff……only if a tree MUST be taken down will it EVER be taken down here in our yard – same as you……It’s just so expensive. We’ll figure out our OWN plan for the back yard – AND we’re getting a tree expert to pronounce just what the scoop is on the other trees before we do ANYTHING. HAPPY SUNDAY and see you, Mau, at the picnic tomorrow at Scouts! How did you do on the Botany test? It was brutal but kinda fun!! Not the landscape news I was expecting…obviously not you either. It is a shame if the trees have to go but then again if they are diseased maybe. Mom would do the same as your dad. First, let’s find out how diseased they are and if they can be cured. When we moved to this house, the lady that lived here had cedars all around the deck out back and there was no light that came in the sliding glass door window. When you stand on the deck, you can’t see a thing. Mom had to have the trees removed. The living room window had a Birch tree right up against the window. Why would peeps plant so close? It gave mom no option but to have it removed. Hi Shoko! You’re right – let the experts decide about taking down trees. Dead ones YES…..the others, we’ll see about that!!! Wonder why she planted a birch so close to the house?!?!?! And those cedars – she maybe wanted privacy but then again shutting out the world isn’t good either! Anyway, I’ll keep everybody posted on what we’re up to…..but no trees will be taken down until the expert says to do it! OMG! Glad you getting expert opinion? Also there are many shade loving plants for example the New Guinea Impatiens and Lilly of the valley just to name a few. Hooray for keeping the lovely maples. We are definitely getting an expert to tell us about the trees………we’re not taking down ANYTHING until we hear from him. You’re right about shade-loving plants – we’re going to get some groundcover going over the bald spots and let the woods grow up around some of the other areas…..the only thing we will do for sure is make a patio area……….IN THE SHADE OF THOSE BEAUTIFUL MAPLES!!!!!! I got my bacon dis morning too!! What would we do without our bacon weekends Travis? I don’t want to EVER find out! Well your Dad-guy would be a handy guy to have around! My Mom and Dad are going to get a tree expert to pass judgement on the condition of the Leyland cypress trees…..we’re not gonna whack down anything until HE says it must go. The maples are staying no matter what though! They are our favorite Fall tree and give our back yard nice cool shade along with the oaks in the woods. Dad’s wallet is having a panic attack….!!!!! We will definitely give you a B, and an A,C,O,N to go along with it!!! Maybe Mom can get another opinion about all those things, can’t hurt, right? We ARE gonna get a tree expert in here before we do ANYTHING…………..we don’t want any trees coming down that don’t HAVE to be down. WE LOVE TREES!!!!! 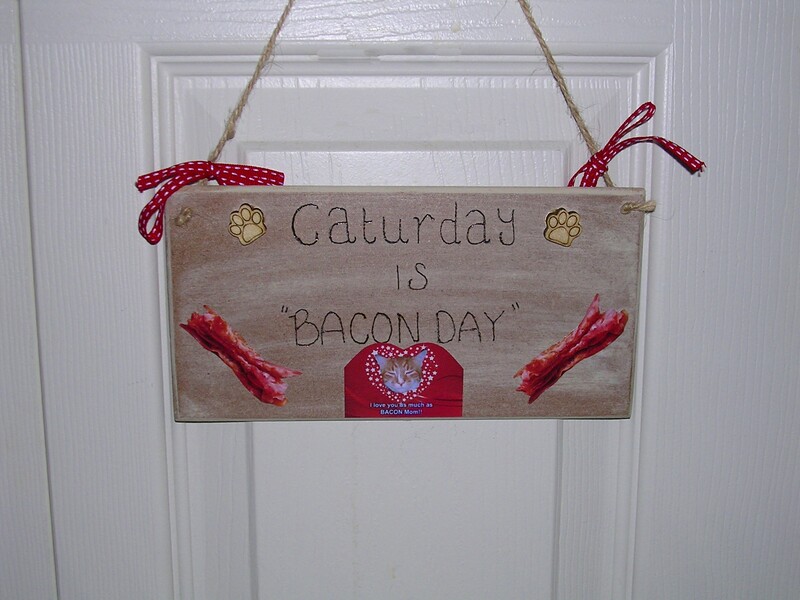 Mee-you Unccle it MUST bee Katurday beecause mee had sum bacon allso!!! LadyMum sayss shee wood luv sum blueberry pancakess pleeze! herss tern out hard fur sum reeson???? Now that iss sad mewss ’bout thee Cypress treess…. Wee say keep thee Mapullss an ask thee man to figure out a bettur plan fur thee backyard….Once a big tree iss gone it iss gone fur a lifetime…..LadyMum told mee that! Poor Pappaw with ‘wallet heartburn’…bettur get him sum Gavvyscon! An pleeze tell yur Mumma not to wurry OK Unccle Sammy? Hi Siddhartha! My Mom makes her pancakes with Bisquick and they are nice and tender. Maybe your Mom could try that if you have it in your stores? We were sad about the Leyland Cypress trees but we will get a tree expert to tell us if HE thinks they must come down….he might say they can be saved. The DEAD ones should come down but the SICK ones – maybe not. Oh no Sammy so sorry to hear about your trees. I hope the specialist disagrees and declares them healthy. Hope you enjoyed your bacon! An wee hopess not all thee Cyprussess have to come down….pawss crossed! Bisquick is good for LOTSA stuff but especially pancakes and biscuits! We just HATE to lose any trees but if they have to go – they have to go. We’ll see what the tree expert says before doing ANYTHING though. Sigh. It’s always something isn’t it Flynn!!!! Oh I just lovvvvvvvvvvvve me some bacon and pancakes! !